This afternoon it stopped raining long enough for me to pop the window out of D3 and insulate that cavity. Surprisingly, I was able to remove the outside window piece from the inside. But I did have a cushy camping chair below it in case I dropped it. 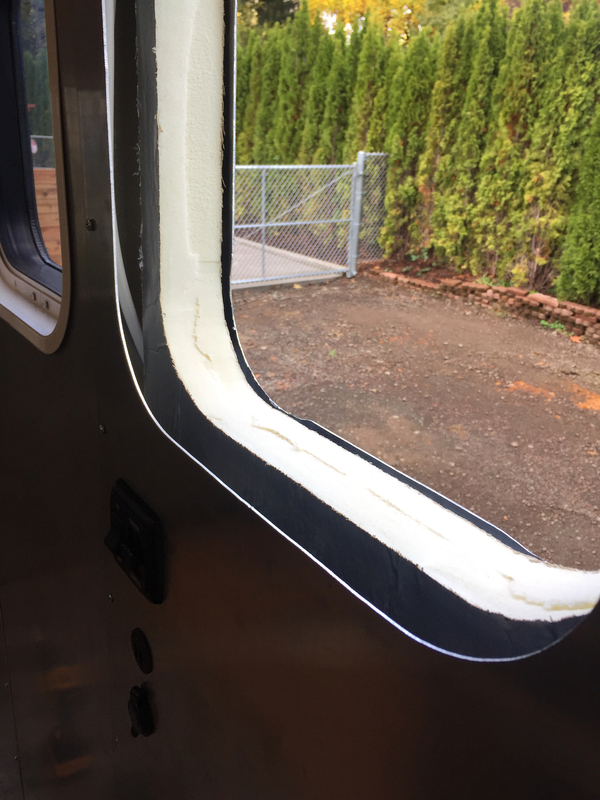 After cleaning out the cavity, I inserted the pre-cut foam boards (upper and lower), made two reference marks through the window hole from the outside, then used the trim ring to trace the cutout on the top piece. Then I jigsawed the hole out from both sides. The foam is still sturdy, and the fit around the window itself will be nice and snug. The 6×6-inch notch is to accommodate the light switch and the two 12V outlets on panel D3, along with their wiring cluster. And here’s the result. Two inches of insulation and a 1-inch gap on the inside which I’m not going to worry about. The R-factor is R-13.1 for just the foam, plus whatever it is for two 1/16″ thick sheets of aluminum. I test-fitted the window and it’s perfect, but I needed Bob’s help to screw it back in. 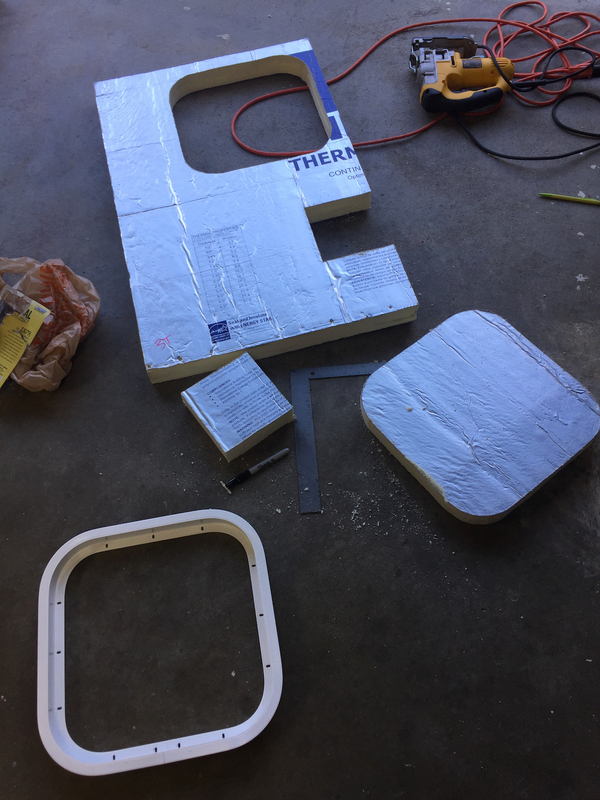 If you’re curious, this RMax Thermasheath rigid foam insulation is made from polyisocyanurate, and is faced with aluminum foil on both sides. “Polyiso” is an environmentally-sound product, and is the most flame-resistant of all foam insulation products. It has a combustion point of 390° F. It does not melt or drip when exposed to flame but rather forms a protective surface char, so its fire resistance is further enhanced, especially in terms of flame spread and flashover potential. And in fact, it’s used regularly in GREEN buildings. So that means the RETROvan is a GREEN vehicle. The black dimmer switch works beautifully. I haven’t yet connected the USB and 12V ports yet. I’m going to make some jumpers and branch them into the switch’s power. But right now I’m tired, it’s Beer:30, and Olivia’s best friend Addie is coming. So, if it is GREEN does Obama give you a tax credit ?